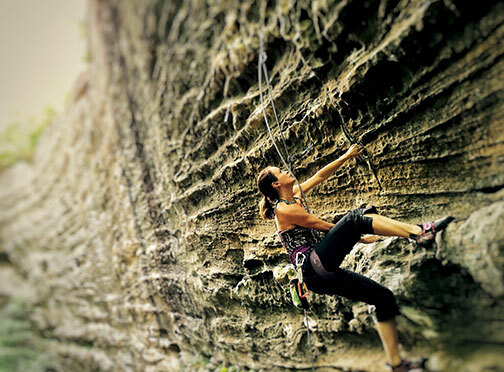 Join Chicks for our Red River Gorge women’s climbing weekend. The Red is home to world-class single pitch sport climbing on pocketed sandstone overhangs and face climbs. There’s a reason that people migrate to the Red from all over the world to climb its hallowed walls. There are literally dozens of sandstone cliffs hidden throughout the forest of central Kentucky in Daniel Boone National Forest. The emphasis of the Red River Gorge women’s climbing weekend is learning and refining the climbing techniques needed to climb all angles of rock from technical slabs to overhanging pockets. Our Chick Guides will provide a fun, safe and encouraging environment for you to hone your new skills. 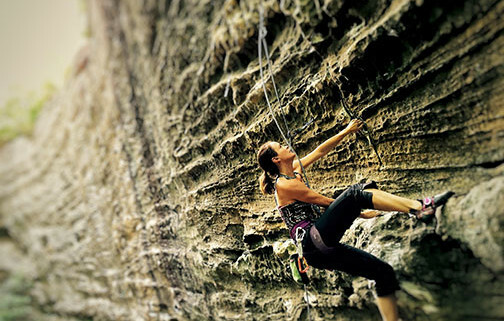 There are miles of cliff that provide plenty of terrain to work on your climbing technique and practice new skills such as lead climbing, anchor cleaning and transitioning from the indoor climbing gym to outdoor climbing. There are 4 different skill levels to choose from and we maintain a small 4:1 ratio so you will have lots of personalized instruction. Each level is comprehensive and aims to make you a more confident and self-reliant climber. You will be paired up with others of similar experience and shared goals, to make sure you are challenged at the appropriate level. 5:00 pm: Check in at the meeting location TBA. 6:00 pm: Kick-off meeting/orientation meeting. Get settled in, get demo gear from our sponsors and you will enjoy a family-style dinner prepared by your guides. You’ll have the chance to mingle with the other participants, get to know your guides and finalize details for climbing in the morning. 8:00 am: Depart for climbing. Bring your own lunch. You’ll carpool to the climbing area with the other members of your group. Drive time will vary on the climbing destination but ranges from 15-30 minutes. 4:00 pm: Climbing day ends. Return to basecamp and unwind. 6:30 pm: Catered dinner at basecamp. 7:30 pm: Hang out time. 8:00 am: Pack up and check out. 8:30 am: Depart for climbing. Bring your own lunch. 3:00 am: Climbing day ends.